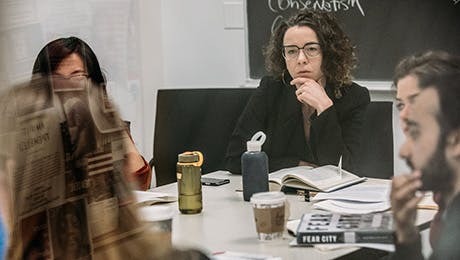 The New School for Social Research fosters a rigorous environment of engaged academic scholarship and public discourse. Our international reputation and location in New York City mean we attract the world's most prominent scholars as faculty, visitors, and guest speakers. Through our selective admission process, we look for both fit and quality in determining admission and aid. Various kinds of financial assistance help students meet their educational expenses; on average, master's students receive scholarships totaling over 40% of tuition. We are accepting Fall 2019 applications on a rolling basis. All applicants are eligible for merit based scholarships, which range from 25% to 75% of tuition. Click below to learn more about required application materials, additional requirements for international applicants, and procedures for returning students. The current tuition breakdown is as follows. MA, MS, PhD, and Certificate Students: $2,180 per credit. MA, MS Students Maintaining Status: $100 per term. PhD Students Maintaining Status: $1320 per term. We understand that a commitment to pursuing higher education is a large financial investment. To help students meet their educational expenses, we provide various types of financial assistance, including scholarships, fellowships, assistantships, stipends, federal loans, and federal work-study. Find answers to some of the most commonly questions asked during the application process. We welcome prospective graduate students and applicants to visit our campus and see how we engage with the rich intellectual, cultural, and political life of New York City to enhance their academic experience. Our students do more than earn a graduate degree-they draw knowledge from many aspects of life in New York City and influence and shape the future of both the city and the world. Click below to schedule a 60-minute graduate admission campus tour. Learn more about academics at The New School by speaking with one of our graduate student Admission Liaisons. These students are available to discuss the kinds of research and study possible in their programs, the nature of particular courses, life in New York City, and student life at The New School. Please feel free to contact our Admission Liaisons by email, or arrange for a telephone conversation or an in-person visit.